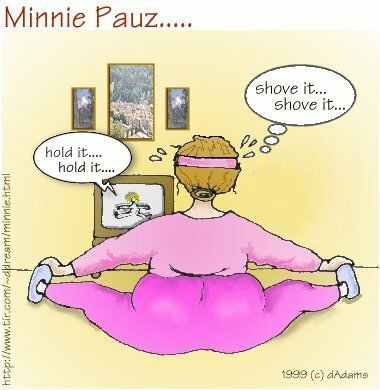 As you have probably guessed if you've been following my cartoons for a long time, Minnie Pauz was a bit "hefty" when I first started out. That is literally what I related to and felt us bigger gals weren't given much attention. I guess I was right because so many women felt like I had given the world a "relateable" cartoon character! I think they liked her attitude too which definitely comes through while she's exercising!